Online dating is not just a young person's game. 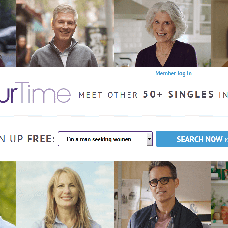 Dedicated to the over-50 crowd, OurTime.com is a dating service for seniors who are single and ready to mingle. Looking for love in your 50s, 60s, or 70s (and beyond!) is different than dating in your 20s or 30s – and this site caters to those differences. Our Time offers a straightforward dating experience with no frills and no fuss. New users can sign up for a free account on the site by filling out basic profile information and writing a short personal essay. With that finished, you can either start searching for matches or complete a more extensive profile. The full profile includes a more detailed About section and additional personal essays, as well as personality questions, the option to add interests, and message ideas designed to act as icebreakers. Without a paid membership, users can search for matches but their contact options are limited. Only upgraded members can exchange email messages or chat via instant messages. Paid members can also see who has Flirted with them, who has Fave'd them, and who has Liked their photos. The experience is significantly enhanced for paid members, making it almost essential to upgrade. Other add-ons can be purchased using Tokens, Our Time's virtual currency, regardless of your subscription status. Tokens come in bundles of 25, 110, or 280 and can be used to acquire add-on features. With Notify Me, you can receive an alert every time a specific member logs in over the next 7 days. With Promote Me, you can put yourself at the top of search results for 60 minutes to attract more attention. Virtual gifts can also be purchased and sent using Tokens. There are multiple options to search for members on OurTime.com, allowing users to choose what works best for them. A standard search is performed by age range and location, with the option to show only profiles that have photos. More advanced parameters cover physical appearance, religion, children, and more. If you prefer the site to do the hard work for you, Today's Matches shows members Our Time thinks you'll like. Our Time also offers more game-like search options. Who Do You Like features a pair of profiles Our Time thinks might interest you based on what you're looking for. If you see someone you like in this section, click their photo and they are automatically sent a Flirt. If you don't like either of the matches, click Skip to go to the next pair of photos. The I'm Interested feature is similar, but shows only one profile at a time. Respond with a yes or a no and you are immediately presented with a new profile to review. It's essentially Tinder's swiping mechanism redesigned for the web. Overall, Our Time is a well done, comprehensive service. The layout is simple and easy to navigate. Communicating with your matches is as easy via email messages, Flirts, and virtual gifts. There is also an option to chat live with other members currently online. The profile contains enough questions that you can make yours unique and exciting for the right person. The site also provides practical advice for meeting on and offline, as well as articles that teach you how to create a compelling profile, offer dating tips specifically for boomers, and more.